Hypertension is the medical term for high blood pressure. This has long been recognised as a serious health concern in people but did you know that it is a common health problem in older cats? Feline hypertension is commonly found as a complication of other underlying medical conditions (so-called ‘secondary hypertension’), although primary hypertension (hypertension without any underlying disease) may occasionally be seen in cats. In contrast to people, where primary hypertension (also called essential hypertension) is most common, secondary hypertension is more common in cats. The most common cause of secondary hypertension in cats is chronic kidney disease but other disease can also predispose to its development and there is a relationship between hypertension and hyperthyroidism (overactive thyroid gland) in cats too. 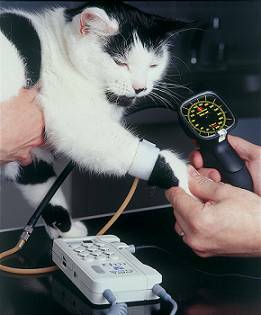 To detect hypertension early, and because it is more common in older cats, we recommend regular blood pressure checks in cats from 7 years of age. Initially these may be done once or twice a year, but as the cat gets older these should be done a minimum of twice a year ideally. The effects of high blood pressure can be quite severe and include blindness, brain problems and heart and kidney damage. We can measure blood pressure in cats using either a limb or the tail! International Cat Care has some good information on hypertension in cats.